Watching sports is not a quirky personality trait, it’s not a way for women to differentiate themselves from other women, and it’s definitely not unusual that women enjoy it. I know several men who think the opposite; that women force themselves to learn everything they can about sports—from the rules of the game to the good and the bad teams—for the sake of standing out. Or they think that women just say they like a sport because the players are attractive. Either way, it’s common for people to not take women seriously when they try to talk about sports. 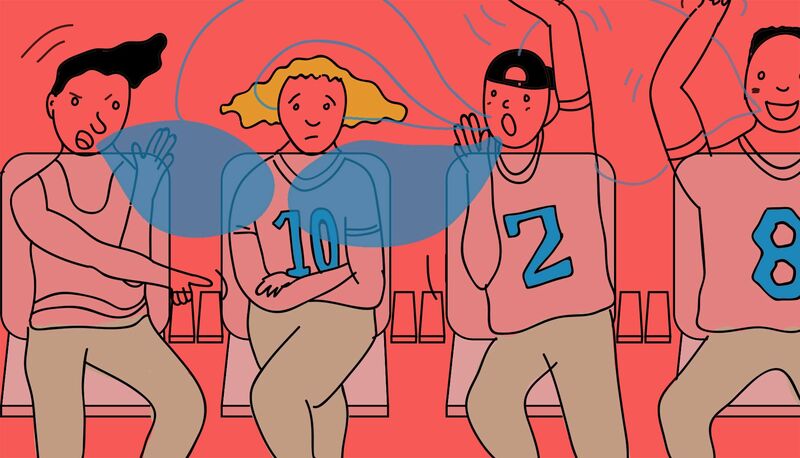 In a group of avid basketball fans with support for two opposing teams, different opinions are sure to be brought up. Maybe this player’s stats haven’t been looking too good the last few games, or maybe this team’s coach has been making bad calls lately. Whatever it is, “sports talk” is bound to happen. As a Toronto Raptors fan, I’d love to be part of the discussion. But my opinions are quickly dismissed, I’m repeatedly interrupted until my voice is drained out, and facts just aren’t believable when I bring them up. It’s not because I don’t know what I’m talking about, it’s because I’m a woman. Most sports are controlled by males, from the administration to the professional players to the journalists. In the media, only 4 per cent of sports media coverage is based on women’s sports, and 12 per cent of sports news is given by women. As viewers, we’re used to watching men guide the conversation, participate in the debates and bring up the numbers. We don’t think it’s any different when the men in our lives do the same. When it’s time for playoffs, the English Football League (EFL), National Hockey League (NHL), National Basketball Association (NBA), and National Football League (NFL) dominate not only sports news, but regular news as well. When a reigning team wins a trophy, it’s everywhere. In the International Ice Hockey Federation Ice Hockey Women’s World Championship (IIHF), Team Canada and Team USA have played in the finals for all 18 tournaments and are the top two in standings. It’s a proud achievement for both countries, yet it’s still disregarded because it’s a team of women. In Canada, hockey is a major sport. The Canadian Women’s Hockey League (CWHL) has been the main front for female hockey players, but the league will be terminated as of May 1 due to financial reasons. Imagine the reaction if the Montreal Canadiens held the same title as Team Canada in the NHL, or if the team’s operations were to be discontinued. By being a woman who likes sports, I’m out of the norm. If I want to watch a basketball game with other fans, it’ll probably be with a bunch of guys who will suggest going to a nearby bar. I’m already shunned by sober basketball fans, why would I want to fight harder with the drunk ones? Why should I have to prove my worth by passive aggressively forcing myself into the conversation and talking about how many games I’ve watched and how long I’ve been a fan? Gender inequality within sports is bigger than the lack of coverage of women’s sports—it boils down to overlooked fans because they’re women. The facts are there, but we shouldn’t have to constantly assert ourselves into the conversation, whether it’s to talk about sports or the imbalance of women in sports media.